mix the salt, semolina and flour together and add the warm ghee to it. Mix well so that the entire flour is oiled and forms crumbles. Now knead the dough (not too thin or soft, just pliable enough) using warm water into a firm dough. The warm water and rava will help make the crust crispier. Cover with a wet cloth and leave aside for 10-15 mins. Take the tuvar seeds/pods and crush them with 2 tbsp water in the blender to form a semi-smooth paste. Now take a saucepan, add 2 tbsp oil to it, then add the cumin, carrom seeds, and asafoetida. When seeds splutter, add the tuvar/lilva to this. Season with green chilli-ginger paste, salt, lemon juice, sugar and the spices. Remove from flame once the mixture is well-cooked and keep aside. Man oh man! Mr. Nirav Shah what a great job you've done. Keep up the good work and keep posting recipes like this. I am a great fan of Gujarati Food. You're a life saver. Sincerely. Dhiman. Thanks for ds mouthwatering recipe. W'l sure try ds week end. HI Ritika, Golu & Vicky, Thank you very much for your comments and appreciation. Rabz, I always read your Recipes try them out and i really love them all. we have small buisness of catering which we run it from home and mostly Gujarati food we serve. 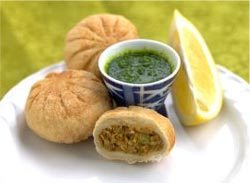 Hi Shweta, Thank you very much for your comments and looking forward to submit some more nice Gujju recipes very soon. Thank you all once again. take care and happy cooking. The picture is sooo appealing.! Vl try this .Thanx 4 posting . Kudos to you for the wonderful recipe, Mr. Shah. Never thought you could be such a good cook. I mean it when I say, your wife must have done something really good to deserve you for a husband who, indeed, is a few steps ahead of the proverbial 'jack of all, master of none' statement. In fact, I find you to be 'NOT ONLY JACK, BUT, ALSO THE MASTER OF ALL'. Meanwhile, looking forward to many more such good recipes from you in the future. Sincerely, Shweta. Nice recipe Mrs shah. Thankx 4 sharing.